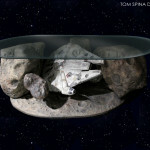 A Star Wars Coffee Table based on the Wampa cave – the first ever table with its own lightsaber? We absolutely love creating one of a kind themed furniture. 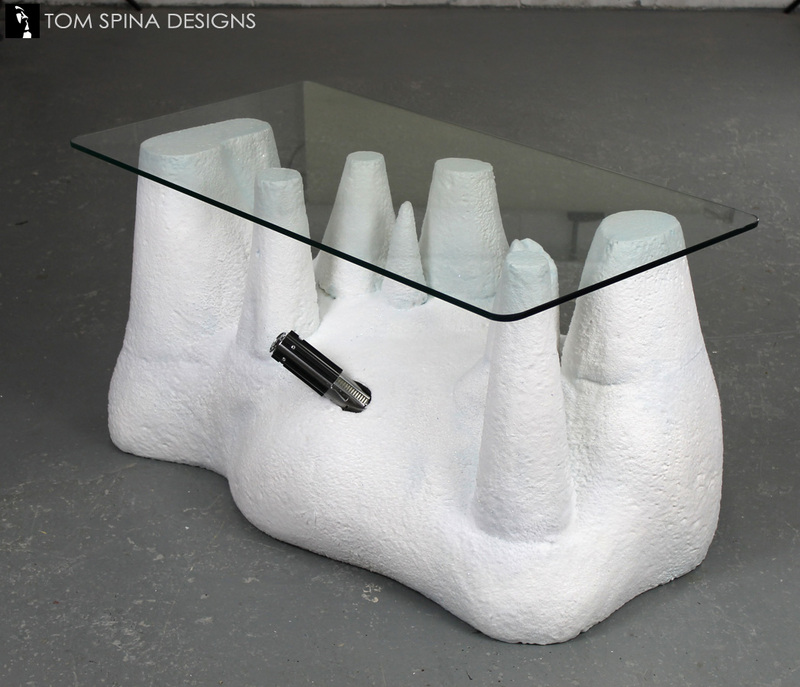 We have done sculpted coffee tables (and side tables) based on caves in the past, using foam carved stalagmites that are flattened off as supports for a glass top. Those always had a rock look but we wanted to do one with a frozen twist. We wanted to do a custom Star Wars coffee table with a similar style. based on the Wampa cave scene! Our client’s favorite movie (like so many Star Wars fans) was the Empire Strikes Back and he wanted a custom coffee table that would bring the film to life for his home theater. We turned to one of our favorite scenes and frozen locations for inspiration. 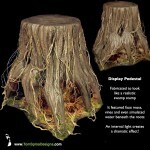 We created the custom coffee table from hand carved foam. The foam was shaped with heated tools and rasps to create the organic snow shapes. 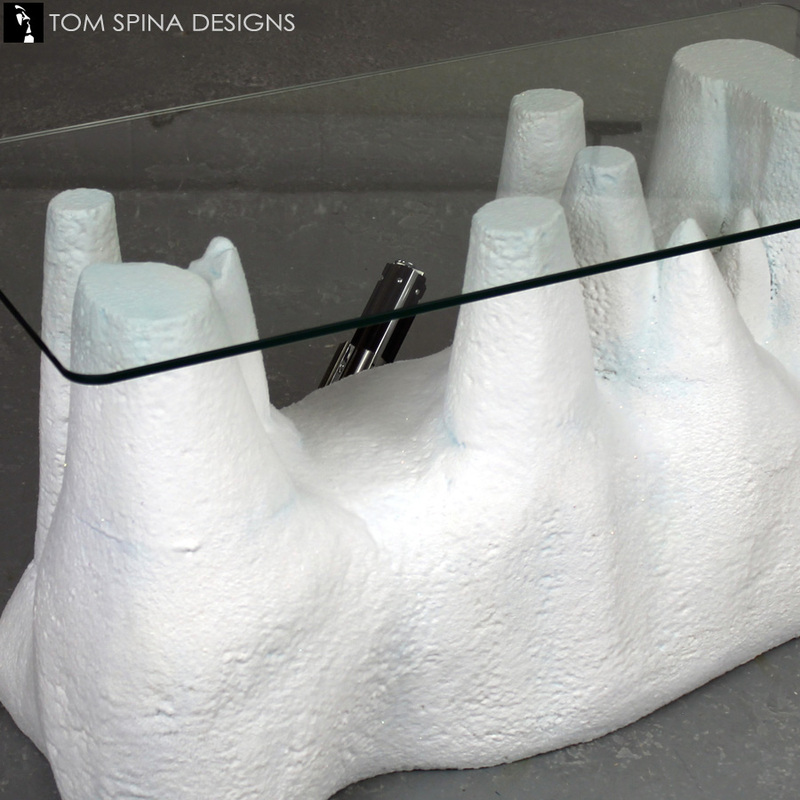 The coffee table features snow stalagmites which were flattened on top to support the glass table top. The prop is painted in a mix of white and blueish tones to give a frozen feel. The base of the snowy coffee table features a removable Luke Skywalker lightsaber prop (one of the licensed FX saber models, very cool!). 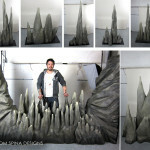 It’s always fun mixing our sculpting and foam carving skills into the world of custom furniture. We’re movie fans and love helping make out clients man caves and home theaters into one of a kind spaces that reflect what they love! Feel free to drop us a line any time to see what we can do for your home, your kids room or even events or productions! 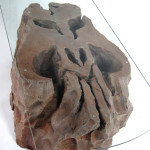 Are you looking for one of a kind Star Wars inspired custom furniture?